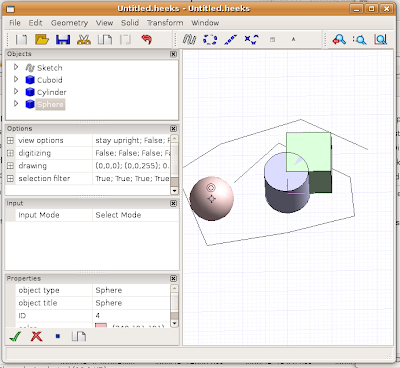 I built HeeksCAD on Linux. I am so pleased. It's got various problems; toolbar icons, graphics refresh. Thanks so much to "archivist" on the #cam IRC chat group, for his help with the basics of using gcc. Now I need to check that all my changes still build in Visual Studio. I have had a go with Ken Silverman's voxlap. 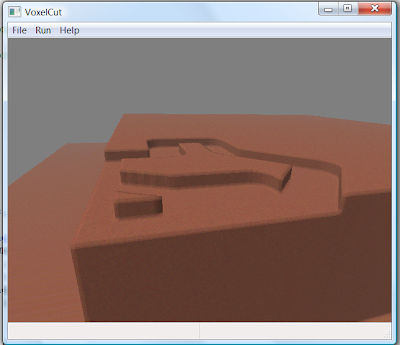 I have made "VoxelCut" a simply viewer made with wxWidgets, which shows an empty world. When you choose Run from the menu, it calls a Python script file. I have implemented some Python functions in VoxelCut, like setcylinder, setrect, repaint. My Python file creates a solid block, asks the user to open an NC file, then it read through it, calling setcylinder, to remove the material in the appropriate places. It would be good to integrate this into HeeksCNC to make a solid simulation. I've been too busy programming to get round to do any machining. I will make an installer for HeeksCNC in the next few days. A few weeks ago I engraved some text on my phone. It is the name of my eldest daughter ( named after a small village near Ripon, UK ). I added the text in Inkscape. I converted the text to a path. I saved as SVG file. I had to add SVG loading to my HeeksCNC software. 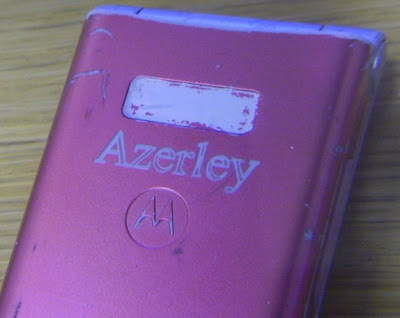 Also, I had to add a function to create a ruled surface because my phone is slightly curved and I wanted the engraving to be the same depth all over. 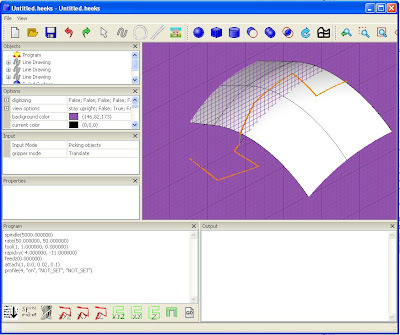 I have added a text command "attach" in the program to attach subsequent tool path to a surface. This was done using the code I had copied from Anders Wallin. I can't show you the file on HeeksCNC because I had not added save function at that time. I made an extension to a servo horn, for my radio controlled plane. Dad has got some suitable small screws, which self-tap into the plastic servo horn. I made the thing out of aluminium. I cut the outside shape with a 3mm slot-drill, and the holes with a 1mm slot-drill. I had to work for a few days on my HeeksCNC software, so that I could fit tangential arcs from lines to circles and from circles to circles to make a smooth shape. My name is Dan Heeks. I am interested in CNC milling and software development, so I am making an open source CAD/CAM application. Also, I have recently bought a Sieg KX1 CNC milling machine from www.arceurotrade.co.uk. It was less than £2000, when I bought it. My father is a precision engineer. He has a Bridgeport Series1 CNC milling machine, so he helped me dismantle, clean, oil and re-assemble all the sliding parts of the machine. The software that comes with the machine is called Mach3. It seems to work quite nicely. It is free, if you only want to do 500 lines of NC code, but I paid $159 to unlock it, when I made a NC file with 1000 lines. But, it's not finished and it's full of bugs, so I wouldn't bother compiling it yourself yet. Feel free to copy any of my code. I press the "Run" button and it shows me the tool path. Then I press "Post Process" button and it makes the NC code. This is controlled by a script language written in Python.